The player acts as if she is going to the right but quickly and aggressively plants the right foot and immediately reverses her motion and accelerates to the opposite left side. Clinical Mechanics and Kinesiology With Web Resource provides a solid foundation so that students of physical therapy, occupational therapy, and athletic training can understand biomechanics and functional anatomy as they relate to both normal and abnormal movement. Written by active clinicians with more than 40 combined years of clinical and teaching experience, this text is also a practical reference for rehabilitation professionals working with a range of populations and pathologies. Taking a clinical approach not found in other texts, Clinical Mechanics and Kinesiology follows a logical progression that maximizes learning. It first presents biomechanical principles that students must understand in order to examine and treat clients and patients undergoing rehabilitation. Next, it explores muscle and nerve physiology and function of the muscle and joint systems. Then the focus shifts to applying those concepts to specific joints. Divided into 10 regions, each joint is evaluated by the bones that make up the joints; the joint articulation, anatomy, and function; and the muscles that act on the joints. In the final section of the text, students gain insight into full-body movement patterns of particular concern to rehabilitation specialists. They will examine not only the usual topics of posture and walking gait but also running gait and the mechanics of jumping and cutting—some of the most common sources of injury. A one-year subscription to Musculoskeletal Anatomy Review, an online anatomy program, provides an interactive forum for reviewing regional structural anatomy. Clinical Correlations included in each chapter help students increase their understanding of biomechanics and kinesiology and apply the theoretical content to clinical practice. Problem Sets and Practice It sidebars with activities in chapters 1 and 2 assist students in applying and mastering biomechanical concepts. Pedagogical aids such as chapter objectives and conclusions, key points, glossary terms, and review questions highlight important information so students can quickly grasp and review the main points. Included with each new text is a key code allowing students one-year access to the online anatomy program Musculoskeletal Anatomy Review. This engaging supplement offers a regional review of structural anatomy with exceptionally detailed, high-quality graphic images—the majority provided by Primal Pictures. Students can mouse over muscles and click for muscle identification. Each chapter features a pretest and posttest evaluation to help students pinpoint knowledge gaps and test their retention. Students may take the pretest multiple times (it is generated randomly so it will never be the same), but students may take the posttest only once. Test results can be printed and turned in, giving instructors the option to use the tests as a grading tool. In addition, instructors will have online access to an instructor guide, image bank, and test package. The instructor guide further encourages students’ learning by offering class assignments and lab activities not featured in the book. The class assignments, at least three per chapter, are quick activities that can be completed in class. The lab activities are longer assignments intended to be completed outside the classroom by pairs of students. Each lab contains an overview, a statement of purpose, a list of equipment needed, and instruction on data collection and analysis. 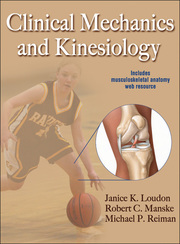 Written for students and practitioners of rehabilitation programs, Clinical Mechanics and Kinesiology provides a foundation in kinesiology reinforced by numerous clinically applicable examples.Students will gain a strong understanding of mechanical principles governing human motion, with particular knowledge of both normal and abnormal functional motions, and be able to apply their knowledge directly to rehabilitation protocols. Primary text for students of physical therapy, occupational therapy, and athletic training enrolled in graduate or professional programs; reference for musculoskeletal rehabilitation specialists. Janice K. Loudon, PT, PhD, ATC, is an associate professor in the doctor of physical therapy division in the department of community and family medicine at Duke University in Durham, North Carolina. She has more than 25 years of experience in clinical sports medicine and has worked as a physical therapy instructor for over 20 years. Previously, she was an associate professor and director of the doctorate of physical therapy (DPT) program at the University of Kansas Medical Center in Kansas City. In 2007, Loudon was named an Outstanding Physical Therapy Faculty by the department of physical therapy education at the University of Kansas Medical Center. Loudon has published more than 25 articles in referred journals, written 4 book chapters, and coauthored two editions of The Clinical Orthopedic Assessment Guide (Human Kinetics, 1998, 2008). She is a frequent invited presenter at national, state, and local conferences and is a member of the American Physical Therapy Association. She resides in Durham, North Carolina. In her spare time she enjoys tennis, cycling, and gardening. Robert C. Manske, PT, DPT, MEd, SCS, ATC, CSCS, is an associate professor of physical therapy at Wichita State University. He earned a doctoral degree in physical therapy in 2006 from the MGH Institute of Health Professions. Manske was also a sport physical therapy fellow training under the guidance of George J. Davies in one of the first sport physical therapy residency programs. As a practicing physical therapist, Manske has over 18 years of clinical experience in orthopedic rehabilitation and actively researches knee and shoulder rehabilitation and sport performance enhancement. Manske has published more than 30 articles in peer-reviewed journals, edited 3 home study courses, coauthored 12 home study course chapters, coauthored 30 book chapters, and authored or coauthored 5 books, all related to orthopedic or sport rehabilitation. He is a board-certified sport physical therapist, certified athletic trainer, and certified strength and conditioning specialist. He is also a member of the National Athletic Trainers' Association and the American Physical Therapy Association, where he serves as vice president of the Sports Section. Manske presents multiple weekend courses on various topics concerning the shoulder and knee and remains active in clinical practice. He also serves as an associate editor for the International Journal of Sports Physical Therapy. He is a reviewer for several journals, including American Journal of Sports Medicine, Journal of Sport Rehabilitation, Journal of Orthopaedic and Sports Physical Therapy, Physical Therapy in Sports, Sports Health, Athletic Training and Sports Health Care, and Physiotherapy Theory and Practice. In 2007, Manske received the Sports Section Excellence in Education Award from the American Physical Therapy Association. He also received the Kansas Physical Therapy Educator award from the Kansas Physical Therapy Association (2003) and the Rodenberg Teaching Award from the College of Health Professions at Wichita State University (2004). Manske and his wife, Julie, live in Wichita. He enjoys spending time with his family, exercising, and watching collegiate and professional sports. Michael P. Reiman, PT, DPT, MEd, OCS, SCS, ATC, FAAOMPT, CSCS, is an associate professor in the division of doctorate of physical therapy in the department of community and family practice at Duke University Medical Center in Durham, North Carolina. He also serves as an adjunct assistant professor in the department of physical therapy at Wichita State University and clinical faculty in the Duke University Medical Center manual therapy fellowship program. Reiman has published more than 30 articles in peer-reviewed journals as well as 9 book chapters and 3 home study courses. He coauthored one text, Functional Testing in Human Performance (Human Kinetics, April 2009), with Robert C. Manske. He has given numerous presentations at national, regional, and local conferences. Reiman is a member of the American Physical Therapy Association, American Academy of Orthopedic and Manual Physical Therapy, Kansas Physical Therapy Association, National Athletic Trainers’ Association, National Strength and Conditioning Association, and Alpha Eta Society. He serves as an associate editor for the Journal of Physical Therapy and is a member of the editorial boards for the International Journal of Sports Physical Therapy and the Journal of Sport Rehabilitation. He is a reviewer for several journals, including British Journal of Sports Medicine, Journal of Sport Science and Medicine, Physiotherapy Theory and Practice, Journal of Sport Rehabilitation, Journal of Manual and Manipulative Therapy, Journal of Orthopaedic and Sports Physical Therapy, Clinical Anatomy, and Journal of Athletic Training. Reiman is a level 1 track and field coach and a level 1 Olympic weightlifting club coach. He also works as a strength and conditioning specialist for women’s volleyball at Friends University in Wichita, Kansas, and for the men’s and women’s volleyball teams at Newman University in Wichita. Reiman resides in Hillsborough, North Carolina, where he enjoys spending time with his family, hiking in the surrounding hills, and wakeboarding with his children. All ancillary materials are FREE to course adopters and available online at www.HumanKinetics.com/ClinicalMechanicsAndKinesiology. Instructor guide. Includes an overview of the ancillaries, sample syllabus, and chapter-specific files containing a chapter summary, chapter outline, class assignments, lab activities, tips on presenting hard-to-grasp concepts, and answers to problem sets and chapter review questions. Test package. Features more than 420 multiple-choice, true-or-false, short-answer, and fill-in-the-blank questions and offers an efficient tool for creating new assessments or supplementing existing tests and quizzes. Image bank. Includes all of the figures, tables, and photos from the text, sorted by chapter, which can be used in developing a customized presentation based on specific course requirements. The image bank is also available for purchase • ISBN 978-1-4504-3403-4.